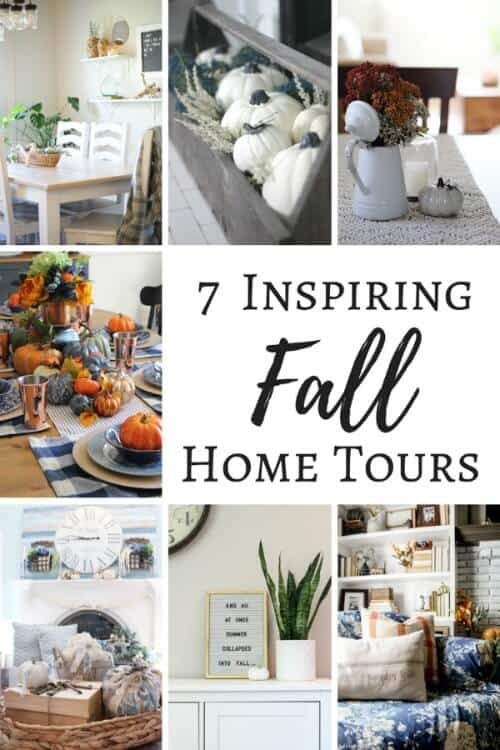 This last week has been a whirlwind of home tours and this one is no exception. In fact, it may even be my favorite. It may be because I love all the hints of navy, or it may be because I’m so pleased with how my very first table styling turned out! 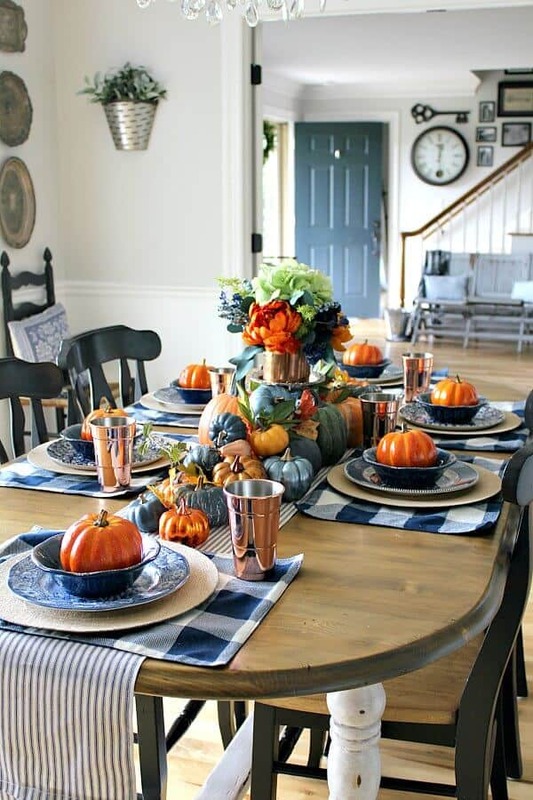 Nevertheless, I hope that you enjoy this Fall Home Tour and my Copper and Navy Fall Farmhouse Tablescape. It all started with these flannel buffalo check placemats. I found them just as the clerk were setting out Christmas decor at Hobby Lobby. They were so beautiful as well as cozy, and since they matched the rest of my fall decor, I just had to get them! I’m completely intimidated by tablescapes and always have found them a struggle, but when inspiration struck, I stepped outside my comfort zone and went with it! The ticking stripe table runner was an easy DIY. Since I had some ticking fabric on hand that I found in a remnant pile, I sewed one together one afternoon. Simple straight stitches and boom – you got yourself a runner! The pumpkins are a mix of some from last year, a few new I found a sales, but the blue ones are painted. If you haven’t seen my Crackle Painted Pumpkin tutorial – you should check it out. It’s the easiest DIY ever! The burlap chargers keep the tablescape rustic along with the crazed bowls, but the hints of copper add a bit of sparkle. I finally tackled my fears and tried something I’ve always put off. I’ll think twice the next time I’m considering a tablescape knowing now that it’s not as hard as it seems. Affiliate links provided for your convenience. Read my full disclosure here. Just watch how quick I can put this all together! I wanted to say a huge thank you to the other ladies in this blog hop for letting me join them and to Jordan for putting it all together. To see a whole lot more inspiration, be sure to check out what the other bloggers shared, linked below. Oh my stars, Jen! I adore your styling and you know I can’t get enough blue! Thank you for doing this hop, my friend!! Thanks for all your hard work on this! You are a rockstar! Tara – you are the sweetest! It has been a joy doing this blog hop with you! I love it all!! Copper & Navy are my favs and to put the together is just perfect!! Such a beautiful fall room! 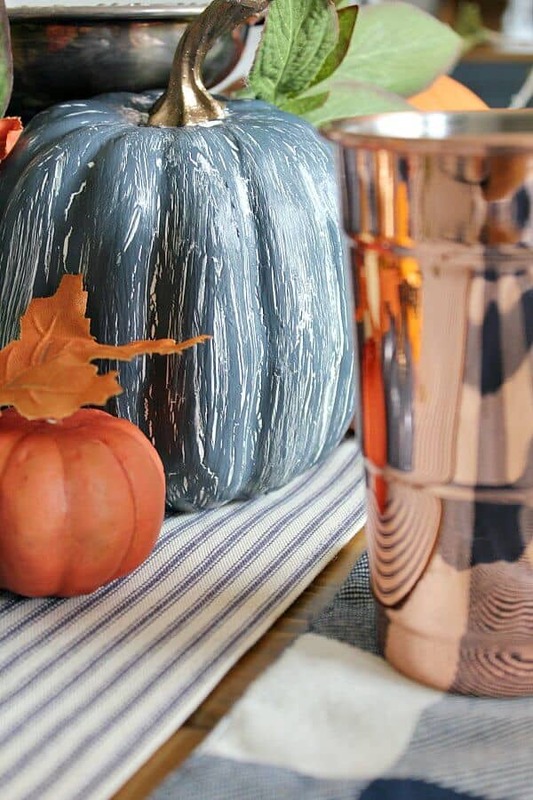 I absolutely love your copper and navy color scheme! Such a pretty tablescape. 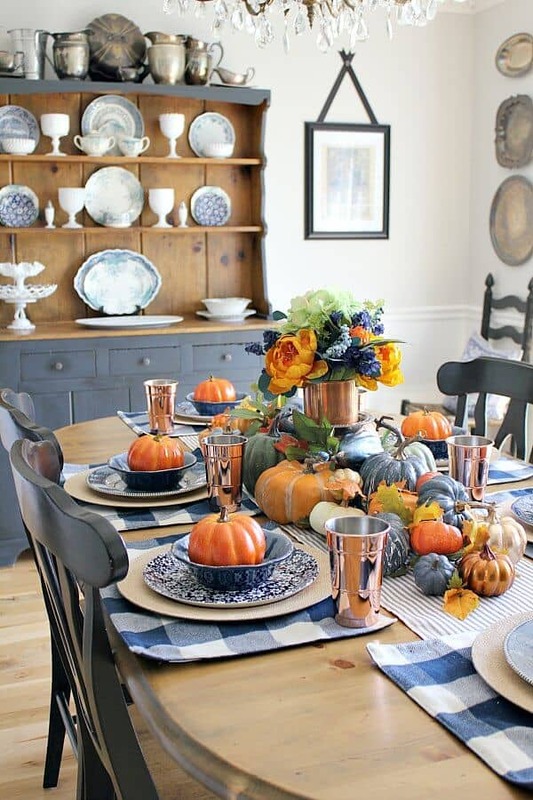 OMG, this is your first tablescape? It is gorgeous and girl friend, you are a natural! You don’t need to be intimidated, ever !, I am after looking at this beauty! 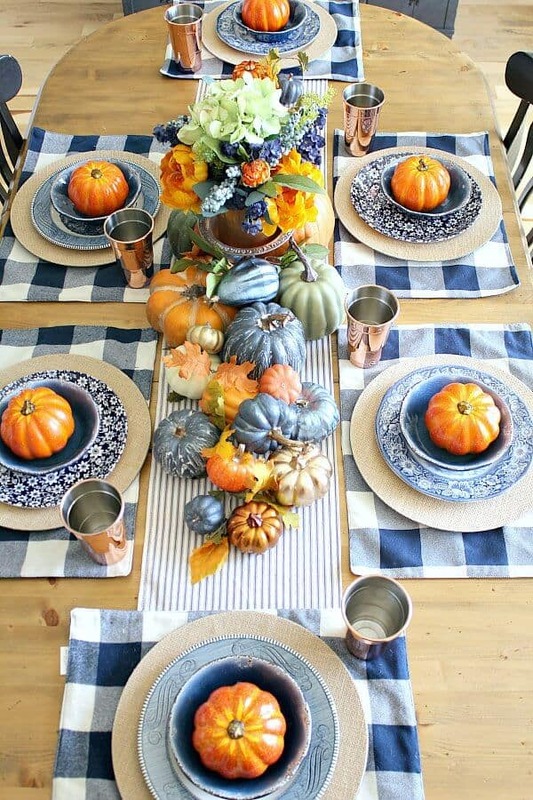 I love your pumpkins, gourds and flower centerpiece raised and your transferware plates are a fav of mine. 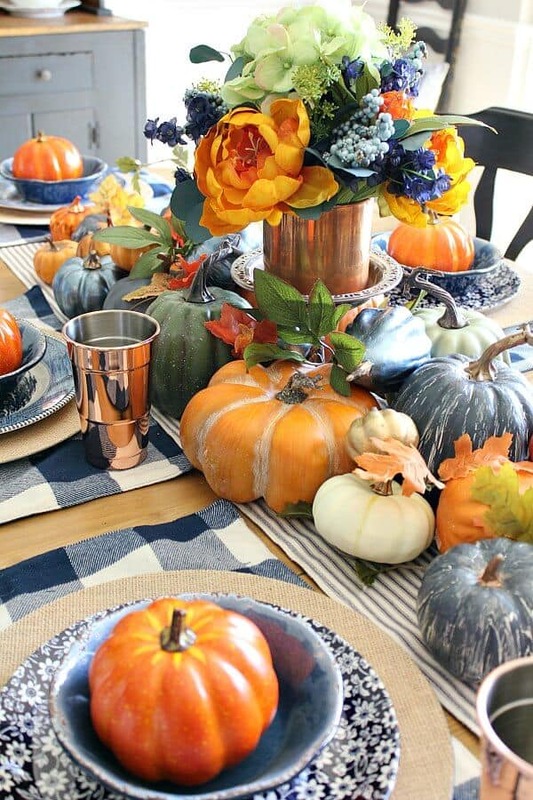 I love the touches of navy in your fall decor. Everything looks so beautiful, but not to fussy. I too am a lover of all things navy. Trisha – you are so sweet! I’m honored that this tablescape inspired you! This was my first attempt at styling one! Your kind words made my day! Fabby – you just made my day! Thank you so much for your sweet words of encouragement! And I’m new to the transferware, too – I can’t stop collecting it! I’m honored to stopped by and took the time to leave such sweet words. Thank you! Thank you so much Joanna! You are so kind! Love this color combo for fall. The orange look so much brighter! Beautiful tablescape. 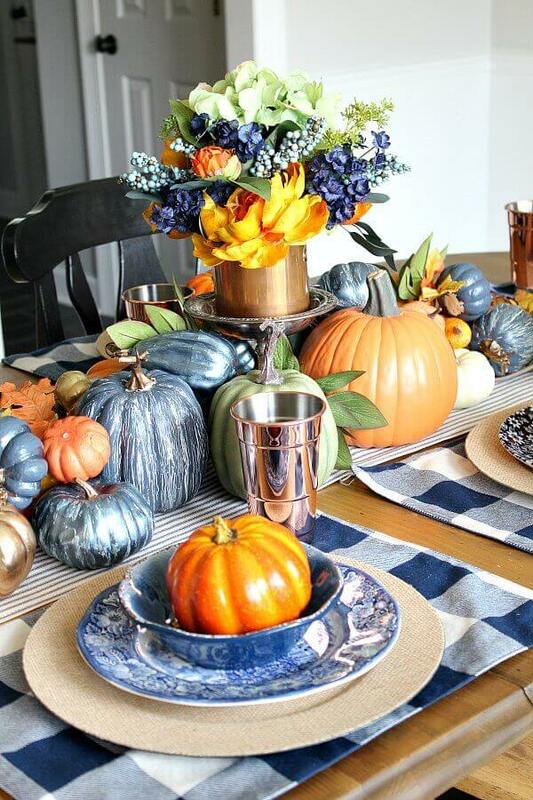 Lovely fall tablescape. Navy and orange always a classic combo! Thank you so much Cindy! I am loving the addition of color to my home! Beautiful! If this is your first, you really have your finger on the pulse! Your home is lovely, and the tablescape fits right in. Thank you so much Alycia! What a compliment coming from a pro like you! This just made my day! Thank you so much Kathryn!! This made my day! I am so glad I found this on Pinterest. 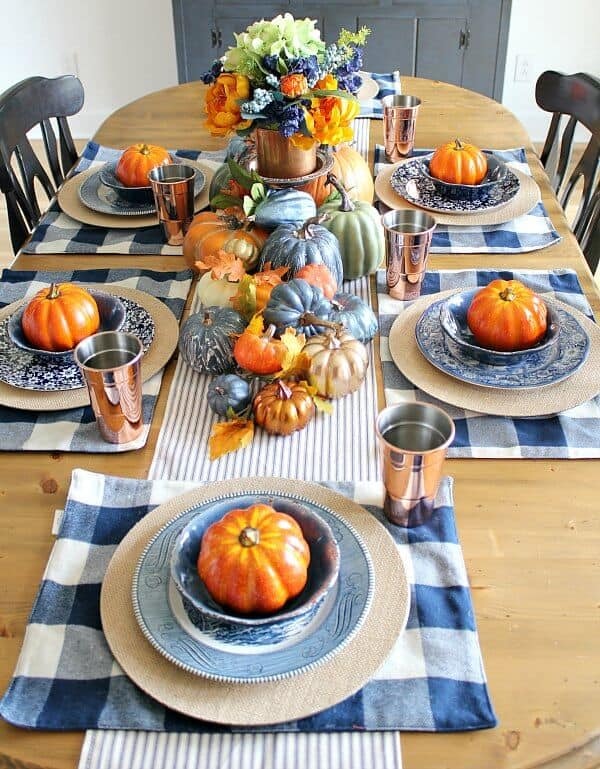 I have blue and white china and I going to try and incorporate it with the orange and gold fall decor I have for Thanksgiving. Your table gives me great inspiration. Thanks! PS – I love the style of your house! Thank you so much Susan! Your sweet words brightened my day!